Discussion in 'The Dallas Art Gallery' started by Snarky's Ghost, Jun 10, 2017. I liked that Southfork upstairs hallway even if it doesn't make sense at all. What I hate is the artwork on the walls. How awfully framed are they? And surely oil tycoon's would have real oil paintings on the walls and not horribly framed prints in frames much, much too big for the prints. Hmmm... I'm not sure about that as it pertains to the frames being too big -- I would think a big ranch house would indeed need big, rustic frames. In fact, one of my visual pet peeves with DYNASTY was that artwork was surrounded by to too paltry a size of frames. 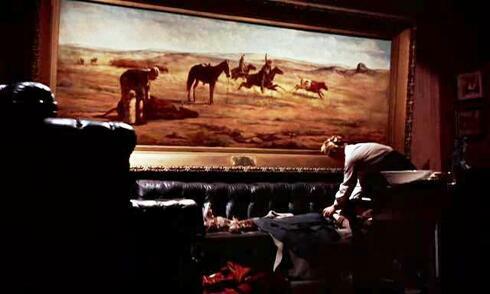 DALLAS' paintings should have big, wooden frames; DYNASTY's paintings should have big, gold frames. "Jock -- those cigarettes are going to kill you..."
It's not actually so much the frames. But more the mounting or matting of the pictures inside the frames. They just look wrong. My friend works at a gallery and those mounts would send him over the edge. They are all out of proportion. And, as you say, they should have been originals. EDIT: I also wish the wainscotting had not be so pu**ified. In the last three or so years of the show, I'd like Southfork's interiors to do something very un-'80s and go a little victorian. It's a matter of principle. The show getting darker and dustier, not lighter and ditzier. I want vivid colors for the wallpaper, the wood trim darkened with a reddish tone, and more baroque glass dangling stuff. Like a haunted house, almost. Or a little bit more like the early decor in GIANT. I'm french, english is not my birth language, so, my apologize for the bad writing. Concerning Southfork, I loved the dark-wood walls (Jock's desk, I presume). The ugliest room I know is Bobby's room on DTNT. Those stars upon the bed.MY.GOD. As disgusting as tatoos.